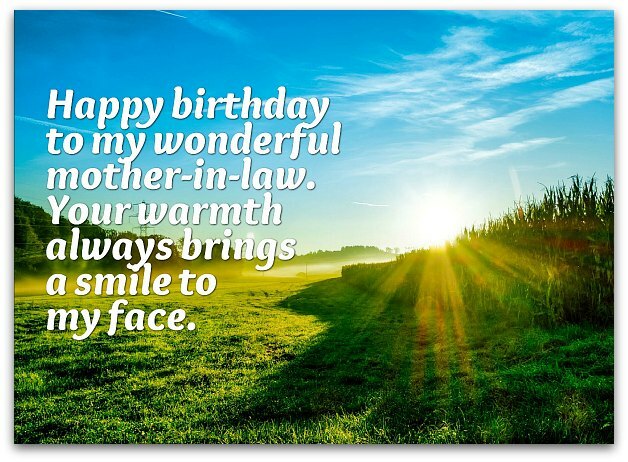 You can't choose your in-laws but you can choose in-law birthday wishes, but selecting the best birthday greetings for your mother-in-law, father-in-law, brother-in-law, sister-in-law, son-in-law or daughter-in-law can be difficult. Choosing a standard "happy birthday" message may lack what every great birthday wish has going for it: the ability to make the birthday boy or girl feel special on their special day. Of course, going the overly sentimental route may be too much. To get started, choose the type of in-law birthday messages you need below. In-laws, by definition, are related to you by law...not by choice. This immediately puts you at a disadvantage when it comes to choosing in-law birthday wishes for them. Why a disadvantage? Because you don't know them as well as your own family — and you may not even like them very much either. Full disclosure: I have a great relationship with my in-laws, so what I've written below is based on the bad experiences of others and some information I scraped together from an excellent article on in-laws. With in-laws, you need to acknowledge a certain fact, no matter how generous you are with your judgement of people: You don’t pick your in-laws — circumstance does. This fact has ramifications, namely that your in-laws can be as sweet as honey or as sour as lemons (I politely refer to the "lemon" variety as “outlaws”). Chances are you have a mix of sweet and sour in-laws. So when it comes to birthday wishes, it's very tempting to tell you to tread softly and take the safe route, sticking to the typical “happy birthday” message. Why? You often can’t go wrong with it (“often” because, sometimes, you just can’t please your in-laws). Of course, I said I was "tempted" to suggest this path. I never suggested that you should actually take this route. In fact, I'm more tempted to recommend another direction altogether. Then, what route should you take? 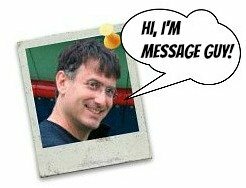 Put simply: you should choose your birthday message as if you were selecting birthday greetings for your own family. According to an article I just read (called "25 Great Tips for Building a Relationship with Your In-Laws"), "boundaries, respect, acceptance, willingness and love can make a big difference to your in-law relationships." That's also good advice when it comes to picking in-law birthday wishes. Common courtesy still applies: If you absolutely detest your in-law, you should still choose a nice (yet generic) "happy" birthday wish as a courtesy. Extend grace to your in-laws: Be graceful with your birthday greetings, even if you harbor ill feelings. Once again, choose a "happy" message. Treat your in-laws like family: With your own mother, you would probably choose a birthday message that reflects her personality. Don't do anything differently with your in-laws. If your son-in-law, for example, is the sentimental type, pick a son-in-law birthday wish that's sentimental. If he's an inspirational kind of guy, take the "inspirational" path with his birthday greetings. Be true to yourself: Choose a birthday verse that expresses your thoughts about your in-law (keeping in mind the three suggestions above, so no bad thoughts). Focus on the positive: If your mother-in-law, for instance, is a generous person (but is nasty in every other way), highlight this positive strength in her birthday wish. Don't pigeonhole your in-laws: Get over your first impressions of your in-laws and try to get to know them better, so you can pick birthday wishes that focus on aspects of their personality you respect or even like. (which makes following the advice right above so much easier). Swallow your pride and let go of your grudges: If you can follow this lovely piece of advice, you will be able to act upon Recommendation #4. Become their friend: Being friends with your in-laws will allow you to pick friend-type birthday messages, always a nice way to go. Find a respectful way to express yourself: Basically, showing some respect to your in-laws will enable you to benefit from Recommendation #1 or #2. One more thing: don't worry about choosing the right message. Because every type of in-law birthday wish I mentioned above can be found in this section, you'll find the one that suits you and your in-law in no time. A little confused by all this advice? Don't be. Ultimately, you just need to pick in-law birthday wishes that make the birthday boy or girl feel special and make you feel good expressing them. I am so blessed to have you as my mother-in-law. You're so good to me. Happy birthday! Have a wonderful day! Today, I want to thank you for all the special things you do, your loving and caring ways, and your patience and kindness. Thanks for being a wonderful mother-in-law. May you have many more birthdays to come. You are the matriarch of our family. You take care of us in so many ways. I'm so fortunate that I have a mother-in-law like you. Hoping your birthday is as amazing as I think you are! Happy birthday to a saint of a mother-in-law. You bless us with your gentle, thoughtful and generous spirit every day. May you always be blessed with the best life has to offer. mother-in-law. Happy birthday to one of my favorite people (really). There's a special place I've reserved for a mother-in-law like you: my heart. You're truly my second Mom. I love you. Happy birthday! As a family, we're so delighted to wish you a big HAPPY BIRTHDAY! As your daughter-in-law, I want to add a few more words: You're the world's best mother-in-law. I'm glad you're mine. I feel sorry for people who go through life with only one mother. I'm lucky that I have two: my Mom and you. Happy birthday to the dearest mother-in-law ever. It's so easy for me to treat you like my own mother — because you've been like a second mother to me since the day I met you. Happy birthday to the world's greatest mother-in-law. On your special day, you should get what you deserve: the biggest and best celebration in your honor. Happy, happy, happy birthday to the finest mother-in-law to ever grace this planet. A little birdie told me that you're upset about getting older. Don't be upset, you're not getting older. You're just getting better and better! It's official! 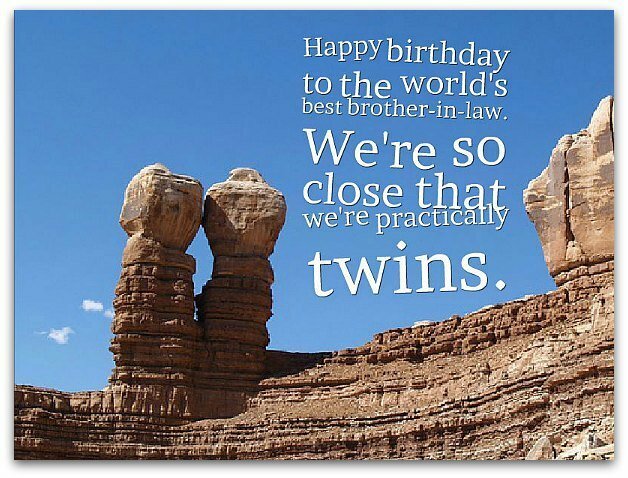 According to a recent survey of one (me), you are the "World's Greatest Brother-In-Law" and will have the "Greatest" birthday! I'm so glad you are my brother-in-law and a part of the family. Happy birthday! Have a fantastic day! Today, there's something I must get off my chest, something I've waited a whole year to tell you: You're an amazing brother-in-law and, of course, have an amazing birthday! Your birthday is not the time to be sad. You're much too wonderful a brother-in-law to feel anything less than wonderful on your birthday. Have a wonderfully special day! It's your birthday, my blessed brother-in-law! I hope your celebration gives you many special moments to remember! May your birthday be a blessed event! I no longer consider you the best brother-in-law — you've been promoted to the rank of "greatest brother" in my eyes. Happy birthday, bro! Happy birthday, bro-in-law! I don't need a Facebook reminder to remember it's your birthday. You're way too special for that (your sister just called to remind me). Very few people in my life are birthday message-worthy. A brother-in-law like you, though, is worthy of the finest birthday wishes. May you be blessed with only the finest of everything on your special day. Wishing a gigantic HAPPY BIRTHDAY to my favorite (and only) bro-in-law and truly one of my best pals. You give all in-laws a good name. You mean too much to me to call you my brother-in-law. I consider you my brother, my friend and my guardian angel. Today, I wish you only the best, because that's exactly what you deserve. From Day 1, you've been like a brother to me, not a brother-in-law. And like family, we've had our ups and downs — mostly ups, though. So, it's with lots of love that I wish you "Happy Birthday." You've always been a great brother to your sister. Now you're a great brother-in-law to me. In other words, you're a great guy — and great guys deserve the greatest of birthdays. So let's make this one great! Today, your birthday wish is everybody's command, so wish for the best. Considering that you're the greatest father-in-law in the world, your birthday wishes may just come true. I hope they do! I will have a great life blessed with joy, hope and peace...simply because I have a saint for a father-in-law. May your birthday be likewise blessed. There's an incredibly special individual in my life — you, my dear father-in-law. You've been my mentor, my hero and my second Dad since I came into the family. Thank you and happy, happy, happy birthday! Dear father-in-law, you have given me two of the greatest gifts ever, two men to love for a lifetime — you yourself and my darling husband. I can't thank you enough but I can start by wishing you a very, very special birthday. Happy birthday to a wonderful father-in-law. Today, you should take a moment to think about your lifetime of accomplishments and give yourself the accolades you deserve. If you don't, I certainly will. Thank you for going beyond the call of father-in-law duty and becoming like a second father to me. And like any father, you knew that was exactly what I needed.